This Fissler® pressure cooker set basically sold itself on versatility alone! Over the years, I’ve had several different makes and sizes of pressure cookers. Some were practical others not suited for everyday cooking. I started with a 4-quart avocado colored Presto with the rocking pressure gauge (the avocado color should date me easily enough). I graduated to Mac Donald’s® 23 quart cooker canner when putting up bushels of fresh fruit was the “in” thing to do. How often do you put up fruit and veggies? So it was right back down to the vintage, aluminum seven-quart Wear-Ever which belonged to my mother in law. That thing scared me! Later, I found my dream piece of cookware – a 4.5 quart, stainless steel beauty of a pressure cooker that was so versatile it rarely left the stove top. Pressure cooker, dutch oven, steamer, soup and stock pot, it did it all with ease in a single piece of cookware. It still ranks as my favorite dutch oven because of its size. During the fall of 2014, a leaky gasket sent me on a search for a new pressure cooker. Why not simply replace the gasket? Unfortunately, the TFal® pressure cooker itself was no longer being made and after an expensive and futile search, even a new gasket with a perfect seal did not fix the problem. How could I ever replace it? It took some time but I did…with a masterpiece of German engineering! Which Fissler Pressure Cooker Set Made The List? Which models made the list? 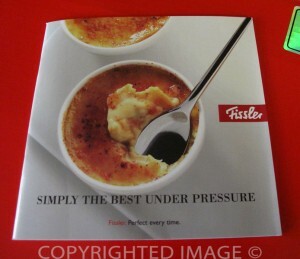 After reading many Fissler pressure cooker reviews, Fissler® said it best on the cover of their recipe booklet. This pressure cooker is “simply the best”. No doubt they are referring to the recipes but after some serious research into the many models of cookers currently available on the market, I zeroed in on simply the best in German technology and workmanship. Actually, it came down to two German manufacturers: Fissler® and the WMF® pressure cooker set. What is the ideal size to buy? Know your pressure cooker capacity! I wanted to replace the incredible versatility of my old cooker and potentially eliminate several other pieces of cookware. Not asking for much, was I? A variety of accessories which can all be purchased individually. Start with nothing more than the frying pan (which comes in two sizes), add a tempered glass lid, maybe a steamer insert and later a deep fry basket. Oh…and then add the pressure lid. Perfecto! But…this is NOT grandma’s pressure cooker! I love to cook and over the years (more than I often care to think about so let’s round it off at more than 50), I have accumulated an assortment of specialty pots and pans – to the point of reaching zero space in the kitchen cabinets. Since it was such a close tie between the two brands, I opted to start with what I considered to be the most versatile aspect of the Fissler collection – their pressure cooker frying pan. What Is So Special About A Fissler Pressure Cooker Set? The bottom of the skillet has a patented Novogrill surface that allows for perfect searing of meat using a minimum amount of oil – or none at all! At just a wee bit over 10 inches, the high quality, stainless steel pan base fits a regular burner but widens at the top. With a 4.2 quart capacity, it is large enough for a family but functions as a “large” pressure cooker for a duo. Don’t feel like using the pan as a pressure cooker? Top it with the glass lid and transform the cooker into a regular pan. Use A Pressure Cooker All Year ‘Round! I use mine all year around and the Fissler® pressure cooker frying pan goes a long way towards making quick cooking of everyday meals a reality. So what is my idea of the best pressure cooker on the market today? If it can be said that a cooking pot is a thing of beauty, then Fissler® makes it and takes the prize. I treated myself to the large frying pan set! Notice how the bottom is narrower than the top? Makes for a better fit on standard sized range burners but wide enough to accommodate a good sized roast. Here is my list of “must haves” in any pressure cooker. A wide base to match the 10 and a half inch wide vintage pressure cooker. Having a pan wide enough to brown several pieces of meat at a time or even a whole fryer if needed instead of just a couple pieces at a time made it quick and easy to prepare a great pressure cooked meal. The standard base of most current pressure cooker models is just a little more than 8 1/2 inch in diameter. Check! With rounded walls please! I’m used to cooking with a 4 inch deep pan. How many times did you burn your forearm along the edge of of the pan or have your hand spattered with hot fat while reaching down to flip a piece of meat? If all you’re doing is adding liquids or a series of ingredients then “no big deal” but you step into the realm of hazardous when reaching down into a deep, narrow pan. Check! Give me shallow and wide. If these features existed in a vintage model then surely they were available in a new generation pressure cooker. The old pressure cooker had a 4.5 L capacity (a wee bit less than five quarts). The skillet holds a generous 4.2 quarts. Close enough. Check! In Europe, there are two pressure settings – low at 6 psi and high at 11.6 psi. For pressure cookers sold in the United States, the standard is 8 and 15 psi settings. If you are in the market for a new pressure cooker, whatever your preferred brand, be sure to check the manual to see which pressure settings are used otherwise you will have to adjust cooking times for certain recipes. In my research, I also discovered that certain pressure cooker models sold in Europe are not sold in the US because they are not UL approved. The Fissler pressure pan set with blue point pressure lid met all of the most important “must have” features I was looking for, nearly all of the “it would be nice if” requirements plus some extras which only add to the functionality of the set. Let’s not forget the high quality of materials and workmanship. Check! I had to get used to the silent treatment – the Blue Point is known for cooking in total silence and steam free while under pressure. How cool is that? The textured bottom of the frying pan works like magic and the pattern built into the base distributes the heat evenly across the bottom of the frying surface. When it comes to adding a 6 or 8 quart pressure cooker to my cookware collection, I’m still torn between Fissler and the WMF®. Maybe even the All Clad 8.5 Qt. cooker. So, I’m torn three ways! During the holiday season, I am usually the official “cook” when the family gets together. We’re talking lots of soups, stews and some of their favorites dating back to the days of the 23 quart cooker. In fact, during the summer, I use the mega cooker to cook a picnic ham which then gets to spend time out on the coals for a finishing touch of grilled barbecue goodness. The result is a spectacular centerpiece on the picnic table. Ever seen young and old pick at a pull apart tender ham with their fingers? The flavor is that irresistible. I should take a picture but I might be accused of harboring cannibals! My current electric range does not handle such a large pan. The surface is much larger than the burner. An 8 or 10 quarts pressure cooker is able to handle meals for some growing boys and hungry girls. If it’s too big, it will only be used once or twice a year. If it’s too small, it will not be able to hold a large ham or roast. What a dilemma! What do you consider to be the ideal “large” capacity for a pressure cooker? Would love to compare notes with other home cooks as to the ideal large sized pan. 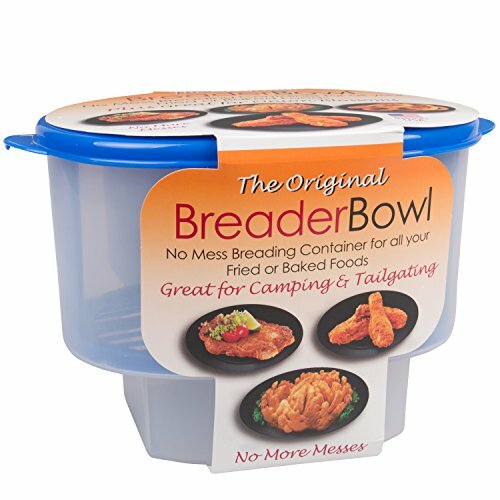 Should I consider a 6 quart or 8 quart for overall best usage? Closing the lid on the pan is as easy as lining up the etched design on the lid itself with the red button on the lower handle. This is where the magic happens when it comes to crispy food. Love how it browns meats without sticking and potatoes turn golden in a matter of minutes without sticking to the bottom of the pan. Like little finger tips holding the food off the bottom of the frying pan. Is the middle of your frying pan the only “hot spot” while anything frying along the outer edges takes forever to turn golden brown? No more…the thick plate at the bottom and the star incorporated within the plate distribute the heat evenly all the way to the edges. Every square inch of your pan is now a hot spot! Perfectly sized to allow you to get a good grip on the pan. The frying pan alone weighs more than 6 pounds. With the lid and the food contents, it’s nice to have a wide handle to help stabilize the pan when moving it. Be sure to check on eBay if you’d like to try the best for a little less. Hmmm….weather has been nice, no rain in sight till perhaps next week and writing about the ham made me consider changing next Sundays dinner menu! All your favorite recipes can be made in a Fissler pressure cooker. Here are a couple of yummy Fissler pressure cooker recipes! 2 Which Fissler Pressure Cooker Set Made The List? 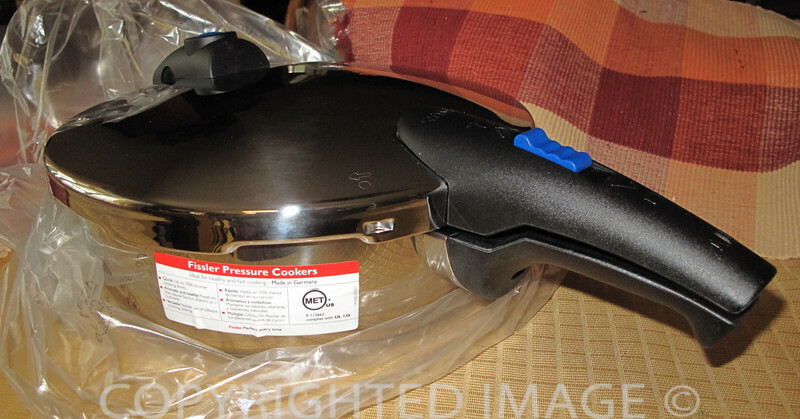 3 What Is So Special About A Fissler Pressure Cooker Set? 3.1 Use A Pressure Cooker All Year ‘Round! Previous Post Samsung Side by Side Refrigerator: Top Pick For My Kitchen! Next Post Braised Duck Legs Recipe: Easy To Make & Simply The Best!